Haidee Swanby is a researcher with the African Centre for Biodiversity (ACB), a non-profit organisation based in Johannesburg, South Africa. The ACB’s work is centred on dismantling structural inequities in food and agriculture systems in Africa and directed towards the attainment of food sovereignty. Mariann Bassey Orovwuje is a lawyer, as well as an environmental, human and food rights advocate. She is Programme Manager for the Food Sovereignty Programme for Environmental Rights Action/Friends of the Earth Nigeria (ERA/FoEN) and Coordinator of Friends of the Earth Africa’s Food Sovereignty Programme Campaign. JOHANNESBURG, Mar 1 2015 (IPS) - The most persistent myth about genetically modified organisms (GMOs) is that they are necessary to feed a growing global population. Highly effective marketing campaigns have drilled it into our heads that GMOs will produce more food on less land in an environmentally friendly manner. The mantra has been repeated so often that it is considered to be truth. Now this mantra has come to Africa, sung by the United States administration and multinational corporations like Monsanto, seeking to open new markets for a product that has been rejected by so many others around the globe. While many countries have implemented strict legal frameworks to regulate GMOs, African nations have struggled with the legal, scientific and infrastructural resources to do so. This has delayed the introduction of GMOs into Africa, but it has also provided the proponents of GMOs with a plum opportunity to offer their assistance and, in the process, helping to craft laws on the continent that promote the introduction of barely regulated GMOs and create investor-friendly environments for agribusiness. Their line is that African governments must adopt GMOs as a matter of urgency to deal with hunger and that laws implementing pesky and expensive safety measures, or requiring assessments of socio-economic impacts, will only act as obstructions. To date only seven African countries have complete legal frameworks to deal with GMOs and only four – South Africa, Burkina Faso, Egypt and Sudan – have approved commercial cultivation of a GM crop. The drive to open markets for GMOs in Africa is not only happening through “assistance” resulting in permissive legal frameworks for GMOs, but also through an array of “philanthropical” projects, most of them funded by the Bill and Melinda Gates Foundation. One such project is Water Efficient Maize for Africa (WEMA), funded by the Gates Foundation in collaboration with Monsanto. Initially the project sought to develop drought tolerant maize varieties in five pilot countries but, as the project progressed, it incorporated one of Monsanto’s most lucrative commercial traits into the mix – MON810, which enables the plant to produce its own pesticide. Interestingly, MON810 has recently come off patent, but Monsanto retains ownership when it is stacked with another gene, in this case, drought tolerant. WEMA has provided a convenient vehicle for the introduction of Monsanto’s controversial product, but it has also used its influence to shape GM-related policy in the countries where it works. The project has refused to run field trials in Tanzania and Mozambique until those countries amend their “strict liability” laws, which will make WEMA, and future companies selling GMOs, liable for any damages they may cause. WEMA has also complained to governments about clauses in their law that require assessment of socio-economic impacts of GMOs, saying that assessment and approvals should be based solely on hard science, which is also often influenced or financed by the industry. African civil society and smallholders’ organisations are fighting for the kind of biosafety legislation that will safeguard health and environment against the potential risks of GMOs, not the kind that promotes the introduction of this wholly inappropriate technology. About 80 percent of Africa’s food is produced by smallholders, who seldom farm on more than five hectares of land and usually on much less. The majority of these farmers are women, who have scant access to finance or secure land tenure. That they still manage to provide the lion’s share of the continents’ food, usually without formal seed, chemicals, mechanisation, irrigation or subsidies, is testament to their resilience and innovation. African farmers have a lot to lose from the introduction of GMOs – the rich diversity of African agriculture, its robust resilience and the social cohesion engendered through cultures of sharing and collective effort could be replaced by a handful of monotonous commodity crops owned by foreign masters. 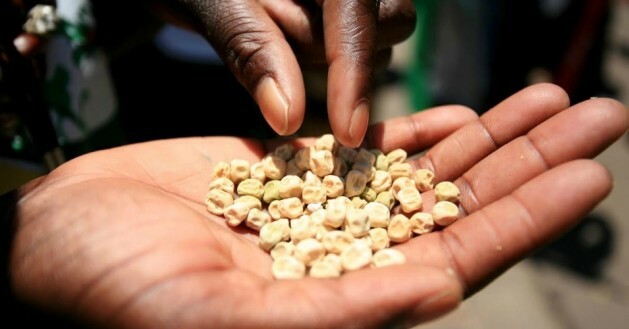 There is no doubt that African small-scale producers need much greater support in their efforts, but GM seeds which are designed for large-scale industrial production have no place in smallholder systems. The mantra that GMOs are necessary for food security is hijacking the policy space that should be providing appropriate solutions for the poorest farmers. Only a tiny fraction of farmers will ever afford the elite GM technology package – for example in South Africa, where over 85 percent of maize production is genetically modified, GM maize seed costs 2-5 times more than conventional seed, must be bought annually and requires the extensive use of toxic and expensive chemicals and fertilisers. What is more, despite 16 years of cultivating GM maize, soya and cotton, South Africa’s food security continues to decline, with some 46 percent of the population categorised as food insecure. It may be tempting to believe that hunger can be solved with technology, but African social movements have pointed out that skewed power relations – such as unfair trade agreements and subsidies that perennially entrench poverty, or the patenting of seed and imposition of expensive and patented technology onto the world’s most vulnerable and risk averse communities – are the bedrock of hunger in Africa. Without changing these fundamental power relationships and handing control over food production to smallholders in Africa, hunger cannot be eradicated. A global movement is growing and demanding that governments support small-scale food producers and “agro-ecology” instead of corporate agriculture, an agricultural system that is based on collaboration with nature and is appropriate for small-scale production, where producers are free to plant and exchange seeds and operate in strong local markets. The views expressed in this article are those of the authors and do not necessarily represent the views of, and should not be attributed to, IPS – Inter Press Service. This opinion piece was originally published by Common Dreams. The sad thing is, they have got a plan under AGRA to use women, creating ‘small businesses’ that will go into the farming areas and persuade the small farmers, many of them women, to convert to buying ‘improved seeds, with all their legal provisos, and thus getting into the GMO loop, then comes the super destructive mono-crops, pushing everyone off the land. I am not against improving or enhancing seeds, but the GMO model of marketing, pesticides and patenting is deadly for poorer countries. The knowledge to improve their seed needs to be made avaialbe to small farmers, with focus on their own seeds, and the features of their own region, and with local laboratories and research.